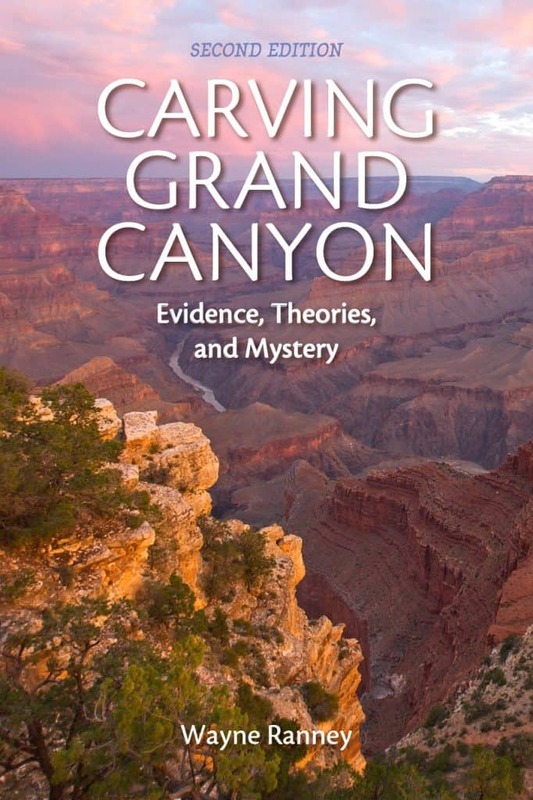 This award winning book, Carving Grand Canyon, is perfect for both geologists and tourists alike. Wayne Ranney’s broad, lucid and all-encompassing perspective of the Grand Canyon region is refreshingly unbiased. This is uncommon in a field where there are many passionate claims about the formation of Grand Canyon. Ranney likens the search for the carving of the Grand Canyon to “six blind men touching an elephant, where each finds a different part that for them is the truth”. But it is not the whole truth, as Ranney tells us “we may never know the whole truth, for as the years tumble by, the evidence disappears” due to erosion. Many theories exist on the creation of Grand Canyon, from deepening during an ice age to the draining of ancient lakes in the Rockies. Ranney, a geologist himself, has written the first book to examine all the known theories and deciphered which parts of these theories are plausible and which are wanting. We understand much about the rocks that make up Grand Canyon. There is even consensus among geologists as to the formation of the rock layers, their ages, and the environments in which they were formed. The evidence is still visible in the rocks themselves. The development and age of the current course of the Colorado through Grand Canyon is another story altogether. Many thousands of feet of rock that once covered the region, are now missing due to millions of years of erosion. To this day, the debate about how the Grand Canyon formed is still very much alive. What were the early drainages that caused the formation? What were the courses of the paleo-rivers that existed in the region? And which erosional methods contributed to the Grand Canyon’s formation? There are still so many unanswered questions in this fantastic and mythical place, which British novelist J.B. Priestley called “a sort of landscape Day of Judgement”. Wayne Ranney is a longtime resident of Flagstaff and the Grand Canyon. He is a geologist, trail guide, author and exceptional lecturer, who brings the landscape history of our planet to life for interested readers. Wayne is actively pursuing other writing opportunities as his readers continually encourage him to tell the story of our planet in more enticing and interesting ways. Like what you see on the AzRA blog? Sign up to receive an email notification when a new article is posted on the AzRA blog. Email used only for article notifications.